So, we bought our house almost 2 years ago. My husband was fresh out of graduate school and we were (and still are!) up to our eyeballs in student loans. The house had a fresh coat of lovely beige paint and we just moved in without re-painting anything. We always knew that we would eventually re-paint the house and change things around to make it our own, but we definitely didn’t have the money at the moment. Fast forward 2 years and here we are . . . still surrounded by beige paint and still not made of money (ha ha!). But our three bedroom home is about to get a little more crowded . . . I am due with baby #3 in about four weeks. That means my 5 year old daughter and 3 year old son will be sharing a room. I didn’t want to move them both into my son’s room that had a sports theme or into my daughter’s room that was covered in girly polka dots . . . I knew we had to make some big changes. I scoured the internet and Pinterest looking for gender-neutral bedrooms and there was hardly anything out there! It is hard to find a happy medium when it comes to a bedroom for a boy and girl- it can’t be too girly, but it also can’t be too much of a boy room. I also had to keep in mind that I was working on a budget and I had to keep this as inexpensive as possible! The first item of business was the bed situation. Unfortunately the bedrooms in our house are TINY!! This bedroom is only about 10 feet by 8 feet. I could have fit two twin beds in there, but it would have been CRAMPED. 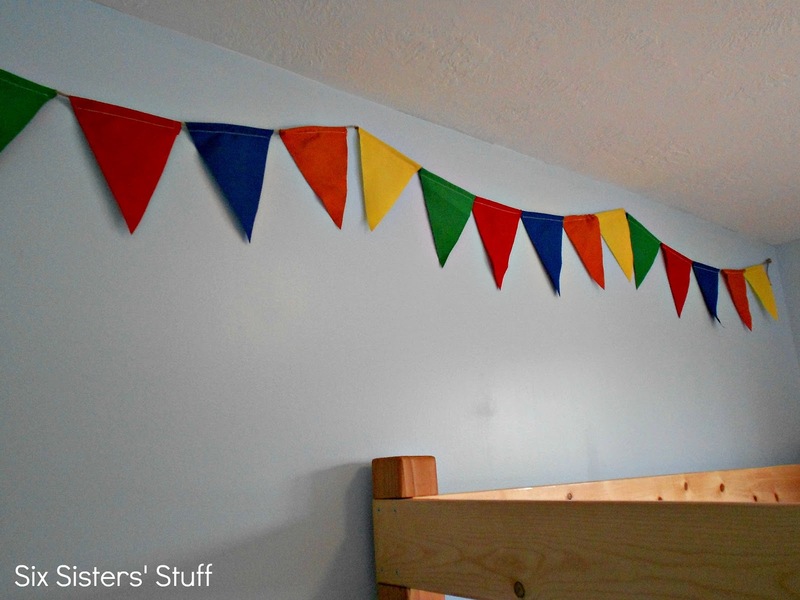 I knew that bunkbeds were going to be our best option, but our daughter had already had a broken arm from jumping off furniture and most of the bunkbeds that we looked at were SO HIGH! I started telling my husband that I wanted bunkbeds that were low to the ground. The wheels in his head started turning and he drew up some plans . 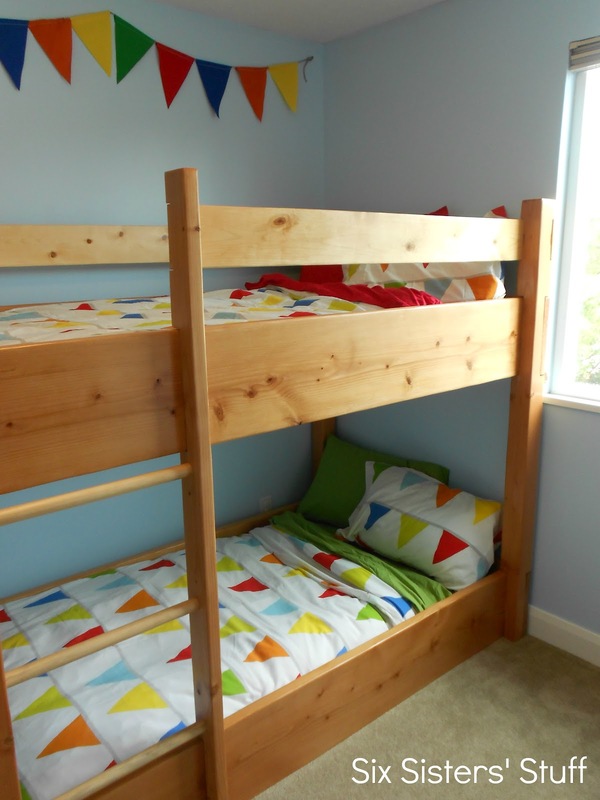 . . the end result was amazing and he was able to put these bunkbeds together for about $180 (seriously, he designed these beds himself! Best husband ever? I think so.). However . . . they took FOREVER to build (he is a busy guy and only had Saturdays available to work on them). 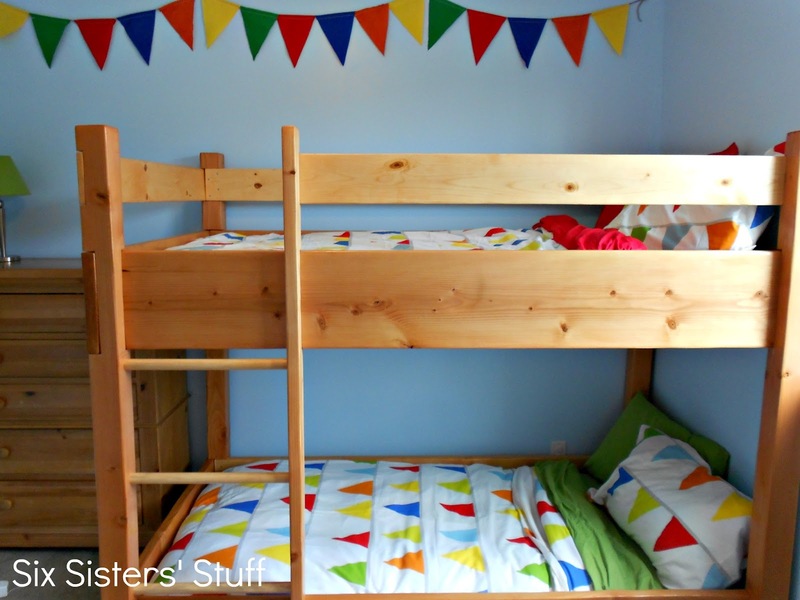 I would highly recommend purchasing bunkbeds if you don’t have a lot of spare time (we later discovered that Ikea carries a great assortment of bunkbeds at amazing prices and even has some low to the ground! Check out this loft bed– you can throw a mattress on the bottom and it’s basically the same idea as the bunkbeds we built!). Next up was the paint. I have honestly never done any painting in my life! However, this was seriously the best thing to make this room come alive! I didn’t realize how drab the beige walls were until we covered them in a fresh coat of sky blue paint (the actual color is Skylark- 530A-2 Behr paint from the Home Depot if you were wondering). The light blue color perfectly matched the light blue on the duvet and it just makes the room so cheerful. I love it! The cost for all the paint and supplies was around $30 (it is a tiny room). Even though it’s a small room, having the bunkbeds has opened up a little bit of space and I wanted to put a little reading nook in one corner. I am working on building some of these pallet shelves that Elyse made a couple of months ago and then I picked up some Pottery Barn Kids bean bag chair covers at one of my favorite stores of all time: DownEast Outfitters. They are basically a huge outlet store for lots of different brands and guess how much I got the bean bag chair covers for? $1 each! Seriously! I tell you- they have amazing good deals! Anyway, I picked up some bean bag filler and was able to fill each bean bag for about $12. 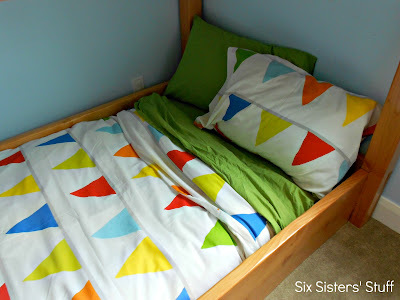 I wanted to add just a little more color and as I was browsing Ikea, I found these brightly colored sheet sets. Sheets can get pretty pricey, but I found these twin sets for $14.99. They are incredibly soft and have retained their color even after lots of washes! I am thoroughly impressed. So add it all up . . .
Not too shabby! And the kids absolutely LOVE it. Even though this post was partially sponsored by Ikea, the opinions are completely my own. I was not compensated by the other companies mentioned in any way . . . I just really like them. It turned out SO cute! I love the flag bunting and the sweet deal you got on the bean bags! And, um, that's so awesome that your hubby built those bunkbeds. Wow! We are actually in the process of doing a Two twin bed to bunk bed transformation. 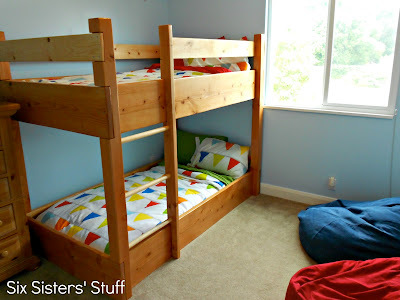 Ours will have a trundle because we have 3 boys that will be sharing the room. 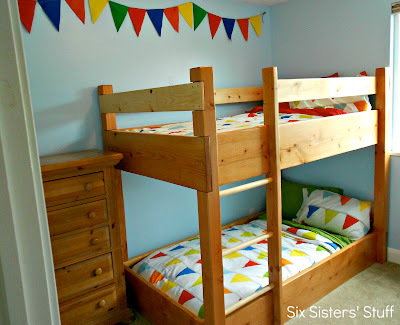 There is something nostalgic about bunk beds. Your transformation looks ADORABLE!!!! No grad-school loans to pay here, but we had to purchase a new roof and a new A/C unit :( That $15,000 keeps us from spending on the 11yo that wanted a "new room". Well, with a $30 gallon of paint from Lowe's and new bedding from the huge back-to-school sale at Ann's Linen, we re-did his room for $140. He is thrilled but not nearly as much as we are! We got him new curtain panels and all new bedding. I took old photo frames and had new pictures of him blown up and put in them. It's all in what you make it. I love it! The colors are so cheerful and go perfectly with the sky blue walls, and I LOVE the bunting! There was a time when my kids were little that my son and daughter had to share a small room for a couple of years. We also painted their walls a relaxing sky blue color. They had bunk beds to save floor space, and I found some quilts on sale with a red, white & blue patriotic theme. I used denim and red bandannas to make an easy valance for their window. We also removed the sliding closet door (that was always getting stuck) and I used red bandanna fabric to make a curtain for the closet. It was also easy to find red, white & blue decorations for their walls, especially around Memorial Day and the 4th of July - flags, stars, etc.